How many of us realise how bad the air quality in Bangalore really is. Check Aqicn.org which publishes real time air quality map for several parts of the world, including 70+ locations in India. 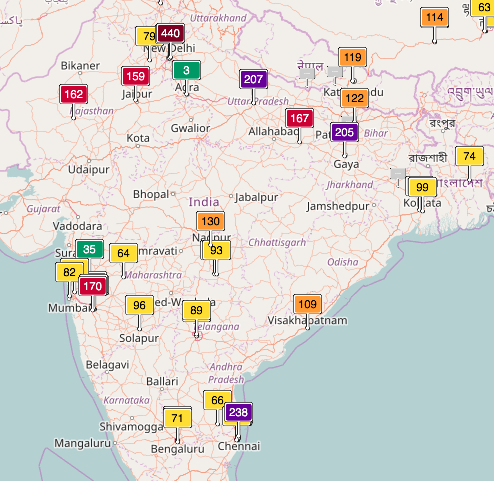 As per this map, air pollution levels in Bangalore are actually better than most other major Indian cities. Infact today when I checked the report was ‘Good’ which is a relief for people who suffer from respiratory ailments, and yet there are seasons when they do. Most of us do not realise that we need to know the air quality in and around our homes under different living conditions. In a media workshop on air quality that I attended in Bangkok, Daniel Kass of Vital Strategies and who has worked for 30 years in environmental health in NYC explained that air pollution is a complex mixture of gases and aerosols which are suspended solid and liquid particles. How many of us, the common man know this? Kass explained that, particle pollution ( PM) is the most measured and an important pollutant that we need to be concerned about. This is dust, soot, smog or smoke. The chemical components of the PM vary according to the source of the pollution. Sources of PM include household fuel consumption, especially from solid fuels, tobacco smoke,power generation from coal or burning of waste, including agricultural and forests. Motor vehicles which include the worst offenders being diesel engines. PM is emitted directly from fuel combustion and formed from reactions with the atmosphere. PM 2.5: These are small particles measuring 2.5 micrometers or less. These small particles consist of things like vehicle exhaust, soot and ash from burning of garbage and small metal particles etc. Prolonged exposure of these is extremely harmful. PM 10: These are larger particles measuring between 2.5 to 10 micrometers. Examples of these are pollen, dust and particles generated from building activity. These particles are relatively less harmful and usually only cause upper respiratory tract issues like allergic rhinitis and asthma. These particles are the reason many residents of Bangalore suffer from asthma. Particles below 2.5 microns ( PM 2.5) are most harmful as they penetrate deep into the small airways and air sacs of the lungs; the smallest particles according to Kass can even pass into your bloodstream. Larger particles between 2.5 and 10 microns in diameter are deposited in the larger airways. The WHO has air quality guidelines for both PM 2.5 and PM 10 with an annual mean of 10ug/m3 and 20 ug/m3 respectively. Nitrogen Dioxide ( NO2) This is formed by fuel combustion used for heating, power generation and engines in vehicles and ships. Sulfur Dioxide ( SO2): This is formed by the combustion of sulfur containing fossil fuels for domestic heating, power generation, ships and motor vehicles. Ground level Ozone (O2) How many of us are aware of this pollutant? This is formed by photochemical reactions in the sunlight between emission from vehicles and industrial factories. Outdoor Air Pollution or ambient air pollution is the air pollution outside homes and buildings. According to research, in 2016 outdoor air pollution caused 4.2 million deaths worldwide and 91% of the population are living in conditions with air pollution above the World Health Organization (WHO) guidelines. The sources of outdoor pollution include traffic related air pollution which is a mixture of tail-pipe emissions and from the combustion engines of motor vehicles with diesel being the most polluting. Particles from brakes, tyres, road dust also contribute to pollution on roads. Household air pollution is mainly in the 3 billion poor who rely on poor quality fuels like biomass ( wood and dung) kerosene, coal for cooking and lighting their homes. These polluting fuels combined with poor ventilation is the cause of air pollution in these homes being 100 times higher than acceptable levels. So, how does one deal with breathing problems and air pollution? Knowing that PM 10 is what causes our troubles, we should do whatever we can to minimize our exposure to these particles. In India, Jal neti: Jal neti is a process in which you pour water through one nostril and allow it to flow out through the other nostril. In the process, the water cleans up your sinus. Frequent cleaning of sinuses helps reduce your lungs’ exposure to allergens. This has really worked for me,every allergy season. Breathing exercises: Breathing exercises and yoga could help accelerate body’s resistance to these allergies. Asthma and rhinitis are reactions of your lung to the entry of foreign particles. They react by generating excessive mucus and by constricting which helps trigger coughing reaction. Basically, your lungs try to expel the unwanted foreign particles in any possible way. However, in the process, they are making breathing more difficult for you. This is where yoga and breathing exercises come into picture. These exercises will make your lungs stronger and increase their capacity. very insightful article Marianne. I was talking with people from a multinational a few days ago and they said that they have a 1000 contractual farmers in rice here and trying to reduce the arsenic levels in wet rice in paddy fields. i will save this article to use as a scale as i am building an online system wireless and real time to measure pollution levels. But these are good KPIs.